Join the ONAC Native EITC/VITA Network! The purpose of the ONAC Native EITC/VITA Network is to share resources and opportunities, to provide a platform for interaction among Native site coordinators, and to bring concerns from Native VITA sites to appropriate parties. Those interested in joining the network may contact Patsy Schramm, ONAC Native EITC/VITA Coordinator, at edgpj@aol.com. ONAC is active on social media! We invite you to join our coalition as a member. Your support helps us to be a sustainable coalition. 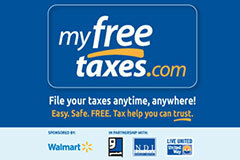 The Oklahoma Native Assets Coalition (ONAC) has partnered with the IRS and agreed to post a link on our website to MyFreeTaxes.com. Please let us know how ONAC can help serve you by taking the Oklahoma Native Assets Coalition Constituent Survey.